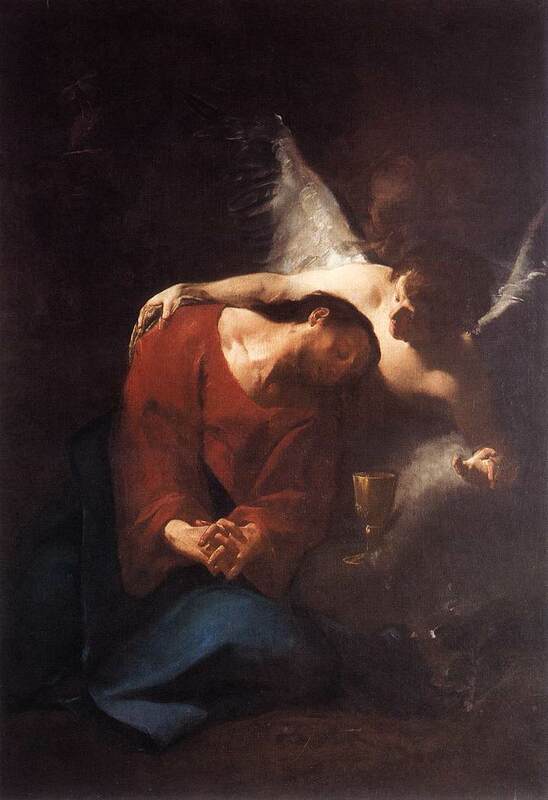 Jesus prays on his knees, with clasped hands; he turns himself towards an angel who holds him out a cup or a chalice. “To drink the chalice” is to accept one’s lot; the comparison between the drinking cup and the fate to be endured is a classic image. At his feet, three disciples are asleep, lying side by side. The group forms a pyramid whose base is formed by the disciples and whose top is Christ. This is a means to mark the tragic opposition between the disciples’ sleep and Christ’s suffering. The scene takes place in a garden on the side of the hill called the Mount of Olives, in the East of Jerusalem. It is also called Gethsemane, which means in Aramaic “the olive press”. 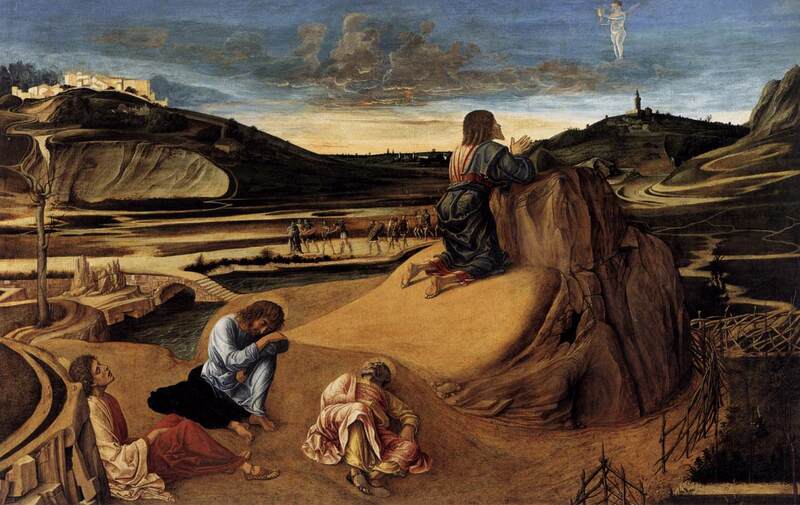 Jesus prays on his knees, looking towards a mound or a high stone on which a cup is to be found. If there is an angel, he can comfort him or present him the cup surmounted by a cross or a host. This cup, or chalice, is the representation of the suffering one must endure to the last. Jesus seems to accept it with calm but one can also find a movement to move it away. The apostles are asleep; sometimes Jesus wakes them up. Peter is then the first to be standing while John is sleeping peacefully and James the Minor is waking up. Sit here, while I go and pray over there. And he took with him Peter and the two sons of Zebedee, and began to be sorrowful and very sad. Then he said to them: My soul is exceeding sorrowful, even to death: stay here, and watch with me. And he went a little further, and fell on his face, and prayed, saying: O my Father, if it is possible, let this cup pass from me: nevertheless not as I will, but as you will. And he came to the disciples, and found them asleep, and said to Peter, What, could you not watch with me one hour? Watch and pray, lest you enter not into temptation: the spirit indeed is willing, but the flesh is weak. The scene repeats itself a second then a third time. Jesus enters into his agony, with the proper meaning of “combat of the soul”. He prays for God to come to his help; that is to say to give him enough strength to do His will. A wide space for these two Gardens of Olives. It is daybreak. In the distance, one can see the city and its Temple and a file of men moving forward in the night; these are the men guided by Judas who come to arrest Jesus. The Agony in the Garden; Giovanni BELLINI; c. 1465; egg tempera on wood; National Gallery, London. The Agony in the Garden; Andrea MANTEGNA; c. 1460; egg tempera on wood; National Gallery, London. Two close compositions in which the angels present the cup but Christ’s feeling is quite different. The Agony in the Garden; El GRECO; c. 1588; oil on canvas; Museum of Art, Toledo, Spain. The Prayer in the Garden; Sebastiano RICCI; c. 1730; oil on canvas; Kunsthistorisches Museum, Vienna, Austria. A close shot on Jesus but with two attitudes so different. Christ on the Mount of Olives; Paul DELAROCHE; 1885; oil on canvas; private collection. The angel has disappeared, but on one side, Jesus in a celestial garment seems already with the Father; on the other side, he is alone in front of the temptation that takes the form of a snake. Christ in the Garden of Gethsemane; Paul DELAROCHE; 1846; pencil on paper; private collection. The Agony in the Garden; Hans HOLBEIN; c. 1505; mixed technique on spruce wood; Furstlich Furstenbergisches Sclossmusuem, Donaueschingen, Germany. An offering or Jesus’ spiritual agony? He puts himself into the hands of God’s angel. 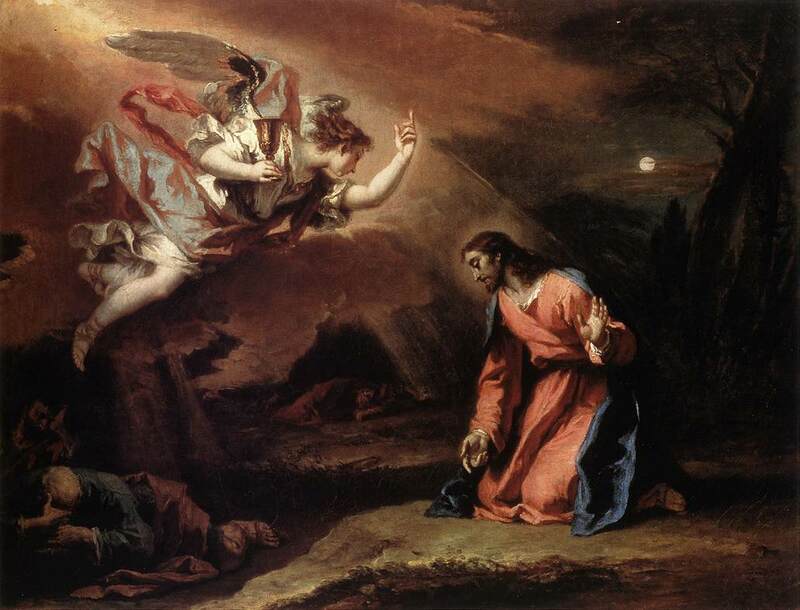 Jesus in prayer with the angel can be isolated and form a pathetic scene called “Mount of Olives”. The Agony in the Garden; William BLAKE; c. 1799-1800; tempera on copper; Tate Collection, London. that is to say to endure one’s suffering or a painful ordeal to the last. This popular expression takes up the image of the agony of Jesus but replaces the obedience to God by a sort of moral duty. The chalice is a cup in metal used to drink. The name, which simply means “cup”, nowadays only designates the one used by the priest for the celebration of mass. which means the olive press in Aramaic, is the name of this garden. This name has remained the symbol of the suffering and anguish in front of death. Man is alone before a god “dumb, blind and deaf” according to Alfred de Vigny, or Does God give to the man who prays him the ultimate sense to his life?